It is important to know health facilities available in the country before you arrive for your Botswana safari. Major cities in Botswana all have good-quality health care services available, including a number of first-rate private hospitals, should you require them during your travels. It is important that you check to see if the areas you will be visiting are located in malaria zones so that you can prepare appropriately; that being said, the relative risk of malaria transmission that the average traveller faces is quite low. Make sure you have the latest safety tips from the establishment where you will be staying, and take common sense precautions as you would when travelling elsewhere. As always, when travelling to any destination, please be sure you are up to date with all routine vaccinations. Visit your doctor several weeks before your trip to ensure that you have all the vaccines and medications you need. The southern and central areas of Botswana that are part of the Kalahari Desert ecosystem are malaria free, as are the cities of Gaborone and Francistown. However, the northern and eastern regions (including Chobe National Park and the Okavango Delta) do lie in a high-risk zone. Risk of transmission is highest during the rainy season, from roughly November to March. Therefore, it is recommended you consult your doctor to see whether you should take malaria prophylaxis before entering Botswana. The course should start 24 hours before entering Botswana and should be taken for 6 weeks after leaving the country. Other prevention methods such as using mosquito repellent and sleeping under a mosquito net are also recommended. Botswana requires a valid yellow fever certificate from all foreign visitors and citizens over 1 year of age travelling from an infected area or having been in transit through infected areas (>12 hours). This rule applies to travellers from the following countries: Angola, Argentina, Benin, Bolivia, Brazil, Burkina Faso, Burundi, Cameroon, Central Africa Republic, Chad, Colombia, Costa Rica, Congo, Cote d’Ivoire, Democratic Republic of Congo, Ecuador, El Salvador, Equatorial Guinea, Ethiopia, French Guyana, Gabon, Gambia, Ghana, Guatemala, Guinea, Guinea Bissau, Kenya, Liberia, Mali, Mauritania, Honduras, Nicaragua, Nigeria, Panama, Paraguay, Peru, Rwanda, Sao Tome and Principle, Senegal, Sierra Leone, South Sudan, Sudan, Suriname, Togo, Trinidad, Uganda, and Venezuela. There is no risk of contracting yellow fever in Botswana. 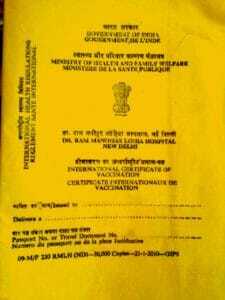 If you are travelling directly from USA or India and are not transiting through a country with the risk of yellow fever, you do not need the yellow fever vaccination certificate.